The Academy’s facilities for landscape architecture are designed to prepare you for a career as a professional landscape architect. Our hands-on learning environment creates a culture that supports curiosity, investigation, and production. Online students are also hands-on, as they engage in discussions and activities through the online platform, social media, and real-time streaming of our events. Both online and onsite studio landscape architecture environments are equipped to give you the skills you need for a career. Our studio and classroom spaces provide a professional and inspiring atmosphere within which to work and dream. 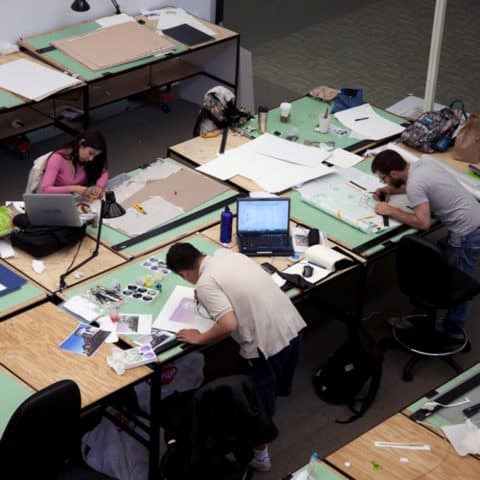 Gain access to drafting tables and storage space when you enroll in a studio. Our lab has 21 Dell computers loaded with the latest versions of all the digital and animation software you will need to effectively communicate your design ideas. We offer one-on-one tutorials and workshops on a regular basis to assist students with their coursework. Our on-site print room is equipped with a large-format color printer and a small-format color copier and scanner. The Cannery is a historic building located along the northern waterfront of San Francisco, near Fisherman’s Wharf. Within walking distance of our third-floor facility are dozens of world-class public open spaces designed by renowned landscape architects and urban designers. With the fabric of the beautiful and complex city of the City by the Bay as your laboratory, you will be able to observe firsthand just what makes an outdoor public place successful.